I could have told you that Ruthven Todd was a Blake scholar (here are his credits in early issues of Blake). I could even have told you that he lived in Spain (among other places), conducted printmaking experiments with Joan Miró, and that his papers are now at the University of Leeds. What I didn’t know until today is that he was also a children’s book author. Space Cat (Flyball) featured in four adventures illustrated by Paul Galdone and published by Scribner’s between 1952 and 1958. In the first he has the good fortune to be adopted by an astronaut, Fred Stone, and proves indispensable on a mission to the moon. 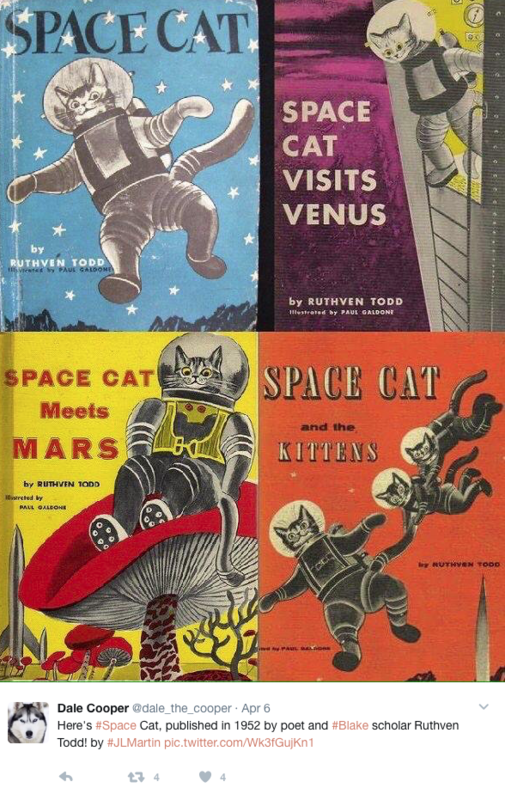 Journeys to Venus and to Mars follow in the second and third books; on Mars Flyball meets another cat, Moofa, which accounts for the kittens (Tailspin and Marty) on the trip to Alpha Centauri of the last installment. The books are now long out of print, though used copies are available online for astronomical prices. “Ode on the Death of a Favourite Cat,” page 4. Yale Center for British Art. 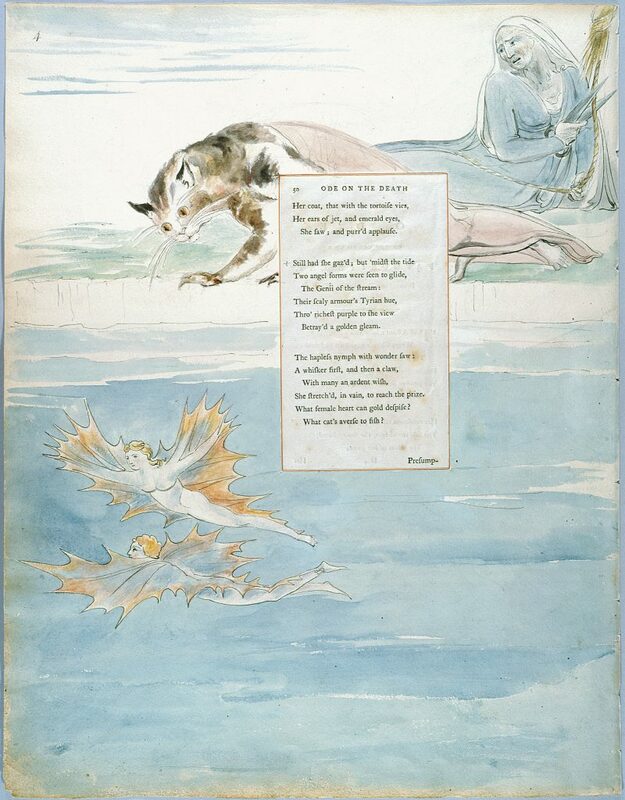 Image courtesy of the William Blake Archive. It made me think, however, about Blake scholars who have had completely different careers or talents or interests—Geoffrey Keynes is an obvious example, with his career as a surgeon. Who else? Well there’s Keynes’ close contemporary, Lieut.-Colonel William E. Moss (1875-1953), who combined a military career with assembling a major Blake collection. He bought Songs (copy C) in 1909. 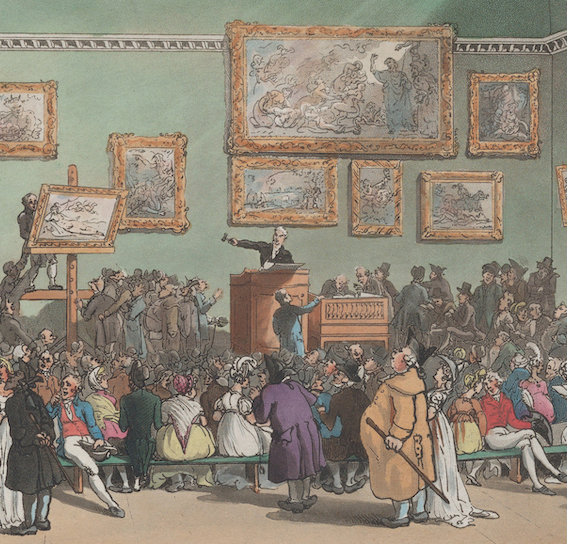 He also owned Poetical Sketches, Visions of the Daughters of Albion, Songs of Innocence, and the copy of America that once belonged to Benjamin West. Most significantly, he owned the only surviving fragment of Blake’s relief-etched copper plates (now in the Library of Congress). This led him to carry out a series of experiments in reconstructing Blake’s printing methods. Moss’s unpublished notes are now in the Bodleian Library. I believe Ruthven Todd had extensive discussions with Moss before carrying out his own experiments in relief etching with Joan Miro and Stanley Hayter. Of modern scholars, only Mei-Ying Sung, as far as I know, has consulted this neglected resource. And here’s a link to Moss’s portrait: https://www.artuk.org/discover/artworks/william-moss-18751953-228532# . Who the artist C.R. might be I’ve no idea.